Buckets N Boards Comedy Percussion Show is one of the best comedy shows in Branson that have continuously captivated audiences for over 7 years. The show’s co-creators Matt Levingston and Gareth Sever have handcrafted a hilarious and high-energy show which features precise percussion, spectacular tap dancing, ridiculous songs, inventive instrumentation and incredible musical talent. Their amusing performance and upbeat personalities will leave you laughing even after the show. Buckets N Boards is an experience that is sure to entertain the entire family. Having performed a headline show for Disney Cruise Lines, Buckets N Boards Comedy Percussion Show is now back in Branson with full force, presenting their comedy, rhythm and unique music at the Starlite Theatre this year 2017. The show also loves to include audience participation, making each performance a one-of-a-kind musical entertainment. Buckets N Boards is rated “#1 Show in Branson” by bransonrank.com for 2013 and 2014 and is regarded as a must see family show for visitors coming to Branson. Buckets N Boards is a comedy duo that is unmatched anywhere in Branson or even in the world. The show delivers unique comedy and incredible musical entertainment that easily stands out in a long list of excellent shows in Branson. See their impeccable and slightly wacky skills including precise percussion on a variety of surfaces, accompanied by delightfully hilarious comedy, silly songs and tap dancing. The amazing talents of the show’s co-creators Matt and Gareth create a show that keeps you mesmerized and laughing from beginning to end, with perfect timing and excellent sense of coordination, coupled with musical skills that help them deliver a show experience you won’t forget. Buckets N Boards may just be one of the most unusual comedy shows in Branson. You’ll surely laugh out at the silly songs of these mischievous musicians, stare in astonishment their phenomenal skills, and find yourself sitting and banging on the seat in front of you. This show is sure to keep the attention of even the most unrefined kids. These unbelievable entertainers turn everyday items to percussion instruments such as boards, buckets, barrels, ladders, and whatever else is sitting in front of them. Yes, these amazing performers even play traditional instruments, they’re both excellent guitar players, and they can tap dance like nobody’s business. 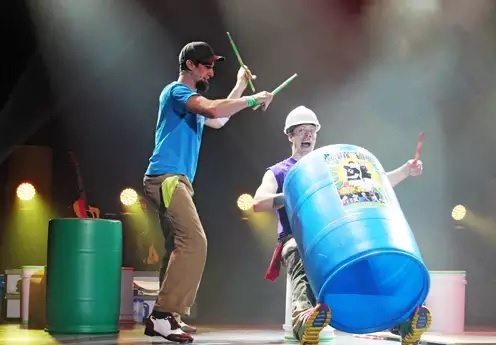 Buckets N Boards is an awesome show in Branson where performers are not just funny, they will blow you away with their percussion, fascinating instrumental abilities and their amazing vocals. Such a great family show that has you laughing the whole time. It will keep you laughing from start to finish and there is a time to invite the audience into their show. Buckets N Boards Comedy Percussion Show is a must-see comedy show in Branson. So, if you like to enjoy the sounds of inventive instrumentation, ridiculously fun songs, sensational tap dancing, and percussion creating delightful rhythm from just about anything on stage, then you’re ready for the breathtaking performance you’ll find at Branson’s Buckets N Boards.